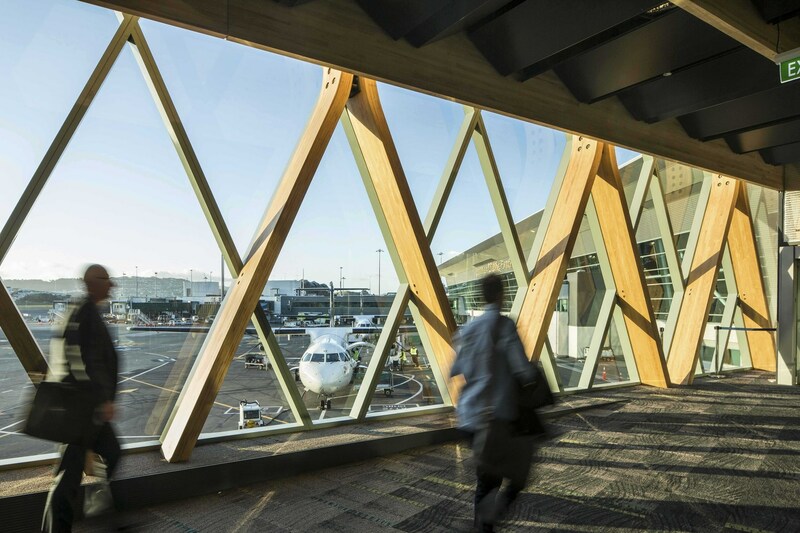 Warren and Mahoney Architects' design for the extension of Wellington Airport in New Zealand highlights the potential of using laminated wood in large-scale architectural projects. The structure of the facade is the result of recognizing the great versatility of laminated wood when designing large structures and complex shapes, allowing, in this case, to propose the construction of a straight piece that is curved to join the next piece. Description from the architects. The southern extension to the Main Terminal Building is a new and significant project for Wellington Airport, providing a response to the Airport’s 2030 strategic goals and is the first major work to the Main Terminal Building since its opening in 1999. The terminal development was designed to facilitate increased passenger numbers for current and future requirements to 2021. This was achieved by providing both increased building area and a reconfiguration of the operational facilities within the south end of the terminal. This included a refinement of the security screening to the South West Pier, reorganized access to the South Pier Regional gates and additional width to the South Pier. The Main Terminal Building was extended by an additional 3.5 bays in a similar look and feel to the existing terminal building, and the extension to the south west pier link widened to incorporate the centralized security screening location, arriving passenger flow control system, South Pier boarding area and increased circulation. The South West Pier link extension is a physical connector between the Main Terminal Lounge and the South West Pier Gate Lounge and South Pier. It is designed to provide an intimate lounge experience with lower height space, a custom timber beam and folded perforated metal ceiling panel system and timber facade structure providing a sense of warmth, whilst acknowledging the detailing of both the main terminal building and the more recently completed international passenger terminal lounge extension (The Rock). The south and north walls are glazed offering passengers views through the glue laminated structural timber frames. The design provides a positive memorable experience for passengers at one of Wellington’s key gateways to the city.